A group of teenagers are in trouble. Big trouble. What began as a playful bit of bullying – ‘a laugh’ – has spun wildly out of control and one of their classmates now lies dead in the woods. The only solution, as it appears to this shocked group of youngsters, is to cover it up. It seems like they might just get away with murder, but the lie that they have fabricated soon becomes bigger than they could have anticipated in Dennis Kelly’s unsettling thriller, originally written for the National Theatre’s Connections programme and now revived by the Hull Truck Theatre. Unlike some other dramatists targeting troubled youth as their subject matter, Kelly does not patronise his adolescent protagonists, nor does he dwell gratuitously on their violence. The terrible act that binds the group together takes place off stage, as does a subsequent instance of violence, thus refusing to make these shocking events the visual centrepiece of the play. Instead, this incident becomes a springboard to explore this group of teenagers and their relationship to the world and one another, relationships that are heightened by the predicament they find themselves in. The central moral dilemma faced by the teenagers – is it better to come clean or to cover up what they have done for the greater good of the group? – is the hinge of the piece, but is far from the only issue that Kelly is prodding at. Much of these issues are communicated through the character of Leah, who barely pauses for breath throughout most of the play. In a constant stream of chatter that betrays her brittle insecurity and desperate need to be liked, this waffling yet oddly insightful teenager touches on profound questions of time, meaning and the nature of humanity in a delicately poignant performance from Leah Brotherhead. While the unrelenting talk occasionally verges on the irritating, Kelly has wrapped up in Leah that very teenage contradiction of developing self-awareness and crippling anxiety, and through her seemingly light conversation begins to get close to the truth of what it is to be trapped in the confusion of adolescence. Leah’s verbal diarrhoea is contrasted with the brooding, indifferent silence of her companion Phil, who seems more intent on his food than on anything she spouts. Crisps, sweets, a waffle meticulously drizzled with jam – rarely has food occupied such a demanding place in centre stage. Despite barely uttering a word, James Alexandrou pulls off the most genuinely disturbing performance of the piece as this determinedly mute yet commanding figure, and when he does open his mouth he formulates a plan to get the group out of trouble with the calm, calculated precision of a psychopath. The most impressive achievement of Kelly’s writing, however, is his lack of condemnation; while we appreciate that what this group of teenagers have done is deeply wrong, we continue to be compelled to care about them and even to an extent to understand the situation that they have backed themselves into. This, we can imagine, is just what a group of panicking teenagers might do when offered what seems to be a way out. While the young characters themselves are for the most part rendered plausibly – if perhaps a little less foul-mouthed than might be expected under the circumstances – the world that Kelly has created has a nightmarish, surreal quality, with echoes of Lord of the Flies inevitably raising their voices. Before the squirming teenagers know it, they are blocked in behind the bars of their own lie, forced down the increasingly twisting paths of a complex labyrinth of deceit. They have fallen down the rabbit hole and there is no way out. 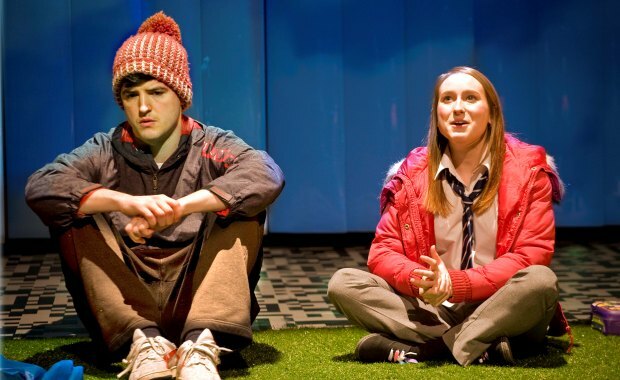 The sense of heightened reality is intensified by the pulsing lights and dazzling projections of this production’s simple but striking design, although the mat of grass that is regularly dragged out for Phil and Leah’s scenes together seems an unnecessary item of clutter in an otherwise effectively minimal set. For such a darkly atmospheric piece, however, there is a sense in which this feels oddly, paradoxically safe. The description of Adam’s death, while building escalating tension, lacks a chill of horror; we never experience the visceral shiver of shock that ought to accompany the darkening action. This may partly be due to a certain elusive ingredient missing from Anthony Banks’ otherwise impressive production, but I suspect that it might have more to do with the text’s uptake by the GCSE curriculum. I certainly have nothing against introducing schoolchildren to such compelling and challenging work – this is just the sort of thing that we should be encouraging young people to see – but I fear that this revival, which has clearly been created with students in mind, has taken the edge off Kelly’s script. Ironically, it is that very edge that might have really captured the attention of its young audience. DNA runs at the Unicorn Theatre until 28 April and is then touring until 25 May.